That is what dwelling in God’s Word has taught me. With these two posts my goal is to encourage you to seek God in Scripture, it’ll change your life! In part 1 I shared how reading the whole Bible impacted my life. If you haven’t read it yet, or want a refresher, you can read it here. For part 2, I want to share a few of my favourite books and some tips to encourage you. At the end I will list some tools I found helpful to navigate the text. Without a doubt, the most valuable aspect was to see the overarching theme of Scripture throughout all sixty-six books and the history they cover. While the books include hundreds of years spread across cultures and various territories, the story remains one and the same. It is God’s interaction with humanity. His creation, our fall, the necessary rescue, and the new life and hope He provides. Indeed, God’s Word is piercing, it confronts, it holds us, comforts us. It can save and change a person’s heart. To read Scripture with a humble heart that desires to draw near to Him, is to have an encounter with the very God who commanded waters to quiet. It is an awe-striking experience from which you do not come back the same. My favourite book by far is Deuteronomy, which I shared in part 1 . Prior to reading the whole Bible, my favourite books were Psalms, Proverbs, and the Gospel of John. Although those are still among my favourites, my selection has widened to include some surprises. In the Old Testament, for example, Ecclesiastes was a book I found dry and depressive in my 20’s though I could see value in its lessons. Reading it in my 40’s with different life experience and worldview, I found the same words freeing. Because everything is meaningless I can enjoy things without having to serve them. And then they are meaningful as gifts the Lord grants us for a time. Proverbs has always been and will remain, a solid favourite. Its teachings often taken for promises are great observations for Christian living. They grab me by the heart today as they did twenty years back. Hosea was among the minor prophets, the one I enjoyed most. How God uses the very names of Hosea’s children to illuminate His redemption story for His people, brought me to tears. Isaiah went from a book with a handful of chapters I had read and lovely quotes sung in Handel’s Messiah every Christmas, to a pivotal link between both testaments, and a gateway to a deeper understanding of Jesus’s pain, sacrifice, and Lordship. To see Jesus so clearly throughout the Old Testament narratives was a most compelling experience. In the New Testament, to cover the gospels chronologically meant reading all four simultaneously. I loved the insight it provided into the writing voices of the different authors. John remains today, as twenty years back, my favourite book in the New Testament, and John 15 my favourite chapter. Luke is now a favourite gospel too. I could appreciate his Greek heritage and medical training in his attention to detail. I often felt his words placed me quietly in the scene and showed me small moments of humanity in the face of the divine. It was exciting to read the genealogy of Jesus in Matthew as I recognized the names listed because I had read all the Old Testament! He wrote as a Jew for a Jewish audience to share that Jesus was the Messiah, and the text is rich and beautiful. Both letters to the Corinthians and 1 Peter felt personal. Hebrews is a gem to understand the gospel. If I had to pick a favourite epistle, it would be Galatians. Finally, the book of Revelation was a phenomenal read. Purely from a reading standpoint, the book captures the imagination, frightens, and convicts. Regarding faith, it seals a precious Truth for the believer – God is in control, and His justice will prevail. When I finally got to the New Testament, I read relieved and hopeful! Jesus is God confirming His intentional love and care for humanity. He is the promise in Genesis 3:15 delivered to fulfill what all the prophets foretold. Jesus embodies the ideals that wisdom literature points to. He comes to show in human form the holiness and power and justice and love of God displayed throughout the Old Testament. He is King and present in creation, yet also intercepts human history and binds Himself to the laws of space and time He fashioned. He came to fulfill the sacrifice that up to then could only be fulfilled by ritual through the law. He filled the gap of our inadequacy, which the law pointed to all along – our incapacity to attain holiness on our own. I wish I were a better writer to convey what my words fail to express! I loved the experience of reading the whole Bible in chronological order and hope to do it again. But it is the reading of God’s Word that I want to encourage you to do. You don’t need to read it in chronological order to yield meaningful fruit. All you need is to open your schedule, your Bible, and your hand to receive what He will give you through it. Establish a conversation with God today. He speaks through His Word, we respond by praying. If you struggle, pray for a teachable heart and show up. That’s all. It doesn’t have to be fancy, complicated, or look a certain way. Ask a friend to do it with you or build accountability by sharing what you are learning. Put one foot in front of the other in the direction of His Word. Don’t let the tyranny of perfection get in the way. If any given day all you have time to read is a couple of paragraphs or a handful of verses, read that and make it count. Chew on it, ask God to meet you there. Look for what the story or passage informs of His character, and how that changes you. Dig deeper; I promise you no endeavour is worth more your time and effort. There were times when I felt that a few paragraphs were plenty because the book I was reading was so dense. If you fall behind in the reading plan you chose, or the goal you set out for yourself, don’t let that detract you. Invest what time you have, not the amount you think you should have. God wants the real you and will meet you right where you are. Read the next paragraph from where you left off. The goal is not to have a perfectly completed plan. The goal is to create a habit of abiding in His written Word. Whether that means to set an alarm, reserve thirty minutes of your lunch hour, or listen to the audio while you run or do laundry; whatever works during your season, bring a teachable heart. His Word will not return empty. What matters is not what it looks like, but what it does to you. To build engagement and continuity, pick a book and read it through. The gospel of John is a good option, so are Genesis, or any of the epistles. You can do a paragraph of a chapter each day. If you are a mom of littles, or a busy student, you probably don’t have a lot of margin. It’s ok if all you have is 15 minutes between naps or 20 before class. Obedience is in the attitude, not the quantity. And faithfulness is built little by little, consistently, amidst the imperfections of life. To quote Jen Wilkin, the Bible is not about you, but it is for you. Time spent getting to know God in His Word is time not only well spent, but it’s also a lifeline. I found my thoughts changing as I kept reading intentionally, meditating the words and storing them in my mind. They’ve help me to grab hold of Truth when my emotions want to take me elsewhere. Scripture is living water because the Spirit of God divinely inspired it. You and I thirst for that water, all the time, whether we can articulate it or not. Because it’s living, it will interact with the deepest part of our being and break the soil that is dry to make it soft and fertile to bear fruit that brings new life. 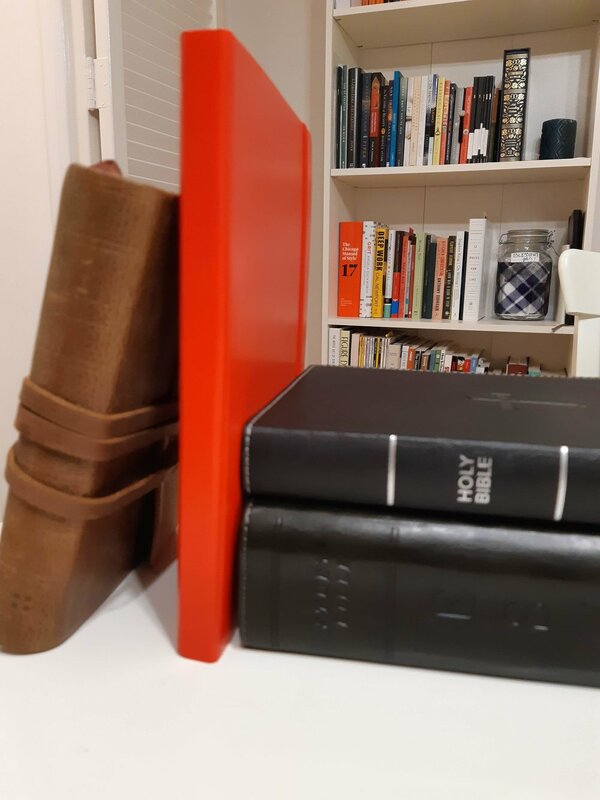 · A Study Bible was essential. Study Bibles contain a detailed introduction to each book, outlining its purpose, author, intended audience, historical context and date when it was written. I chose the ESV (English Standard Version) as the main translation because my intent to dig in and study, and for that, a word for word translation is best. · Reading different translations helped me grasp some texts that were harder and where my brain slowed down too much because the writing felt dense. Although I did all my reading in the ESV, I complimented with NIV (New International Version – a thought for thought translations) and CSB (Christian Standard Version) for some of the historical narrative books in the Old Testament. The NIV is very readable, and I found it particularly useful for devotional reading. · I would be remiss if I didn’t mention, as I have before, Jen Wilkin’s Women of the Word. That book forever changed how I approach my reading of the Bible ever since I read it a few years ago through a small group study at my local church. I can’t recommend it enough! It reads quickly. If you haven’t, get a copy and read it, you won’t regret it. · There are good online resources that can make some basic tasks quicker. If I wanted to compare a short exert in other translations, I would use BibleGateway and click on the option to see several on one screen. · For commentaries and other tools, Bibletools and BlueletterBible are useful to dig deeper. These also exist in app form that you can download on your phone. · Youversion was great for times I left early in the morning and didn’t have time to read. I would listen to the audio while on the subway on my way to an early meeting. It helped me to cultivate my time in the Word, no matter what. · Often, when I’d finish a book, I would watch the corresponding video from the Bible Project. It is short, beautifully done, creative, and a great way to review what I had studied. Older Post How can the Church love Single Women?